The land-speed record for steam-powered locomotion has been holding steady for 88 years at 127mph, but a team of British engineers and stunt drivers will attempt to break it with the Steam Car. The Steam Car works by burning liquid petroleum fuel at 750° F, which heats 10.5 gallons of water, converting into steam. The steam passes through lagged pipes before it is injected into the 360-hp Curtis turbine at extremely high pressure and speed via compressed air hydraulics. It spins the turbine at over 13,000 rpm, powering the rear wheels, allowing the car to reach speeds higher than 150mph. 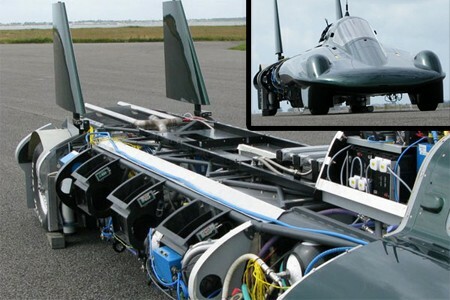 The car itself is 25 feet long and uses about 1.86 miles of tubing. All of the hot pressurized steam is ejected from the exhaust, which means the car is only capable of running for about 3 minutes, and requires an 8-minute warmup. The attempt to break the speed record will occur in late August at Bonneville. We’ve served up dozens if not hundreds of machines with a practical purpose, but we are always interested in machines like those [Steven Laurie] makes, which serve no other purpose than looking impressive, spewing smoke, leaving tire marks, and making a lot of racket. 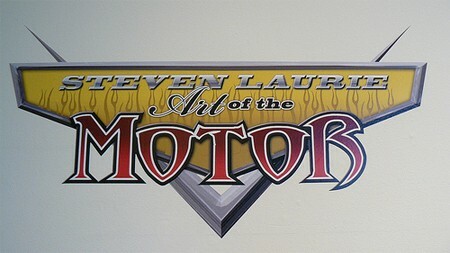 We’ll give you the scoop on Steve’s motor art after the break.